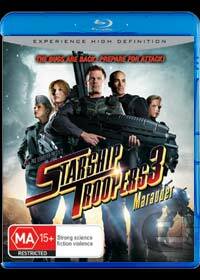 Based on the original film Starship Troopers that was directed by Paul Verhoeven, Starship Troopers 3: Marauder once again returns viewers to this rich science fiction universe which is based on the 1959 novel by Robert A. Heinlein, the Starship Soldier. Unlike the “sequel”, Starship Troopers 3: Marauder is more like an official sequel to 1997 movie as it returns Casper Van Dien as Johnny Rico who has managed to survive the bug war and even be promoted to Colonel. As the Federation is still involved in the “Bug War”, there are now sentiments against whether this war is causing more damage than good. The film starts on the farming planet called Roku San where Johnny Rico receives a visit from one of the Federations most acclaim Sky Marshalls, however the electrified perimeter that is protecting the colonists is somehow disabled that causes the planet to be thrown in turmoil. Fortunately for the sky Marshall, he is rescued by Captain Lola beck (Jolene Blalock) who is looking as stunning as ever but as they attempt to return to Earth, their space cruiser is hit by a bug attack and they are forced to land on a bug infested planet. To compound the situation, Johnny Rico has been court marshaled by an old friend and in a classic war movie twist, his execution is staged, nevertheless he must now help recover the missing Sky Marshall. The movie features quite a few references to the original movie such as Federation propaganda “it’s a good day to die”, over the top acting and cliché after cliché. As a fan of the original, this current incarnation does compliment the first movie, however where the movie will lose points is in its special effects department that dances between poor to good. However as the movie was created for the DVD market, this can almost be forgiven but it would have been nice if the developers decided to make this into a fully fledged motion picture. The video quality of Starship Troopers 3: Marauder is quite detailed at times, although does have a few scenes with an excessive amount of noise. The colours are quite vibrant and some of the poorer special effects will be definitely more noticed on the high quality of Blu-ray. The audio quality of the film is quite good, although sometimes the special effects do take precedence but through our surround sound setup, the quality was impressive. The disc contains a plethora of special extras from two commentaries to give you a true insight into the behind the scenes of the movie and the justification of this “B” grade movie that is quite entertaining and informative at times. There are also some interesting featurettes, interviews and facts about the world of Starship Troopers. The worst special features is the music video by Sky Marshall Omar Anoke who sings “It’s a Good Day to Die” that is quite scary but is a part of the strange world of Starship Troopers. Definitely a movie to be watched by those who enjoyed the first movie or for those like an almost spoof science fiction movie. Definitely cool!